These packs are intended to make a gift very special, containing gift boxes and labels in the same design as the greetings card. Each kit contains three separate pieces of perforated paper, with backing paper for the card, and thin cardboard to line the box and gift label. There is also ribbon to complete the label and tissue paper to wrap the gift in the box, plus threads, needle, thread card, envelope, charts and full instructions. 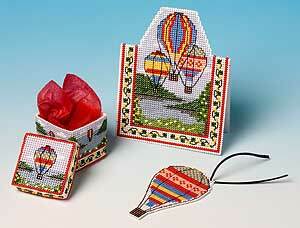 This colourful design of drifting balloons on a summer day is called "Flight of Fancy". The greetings card is 11.8 cms high, the box is 4 cms high, and the gift label 8.5 cms high.